Look more fabulous than ever before by emphasising your lashes. 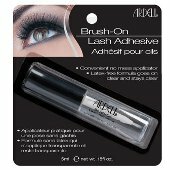 Try Ardell Brush-on Lash Adhesive 5ml and make sure that your accent lashes holds into place to keep you looking fabulous. This product is formulated to give you that clean, mess- free look in minutes! Simply take the guesswork out of application to apply the adhesive easily! Its brush makes the adhesive application precise, quick and simple. It has a no mess applicator, letting your accent lashes securely in place all day. Keep out of children's reach. Always check the label before use.